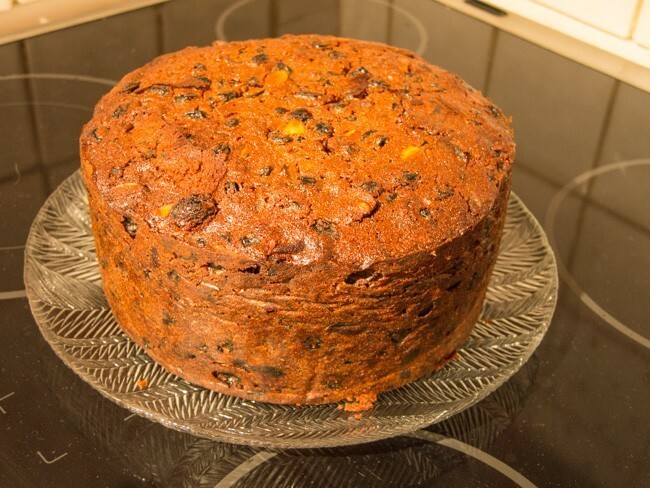 I only started making our Christmas cake annually a couple of years ago. It seemed like too much hassle and the supermarket one was fine if you doused it up with enough booze. But then I bit the bullet and it has definately become an annual ceremony. The actually making doesn’t take too long; the fruit is best boozed up a few days before, a bit of stirring and then hours in the oven when it just needs occasional checking but not onerously. And then the boozing up, my favourite ritual. 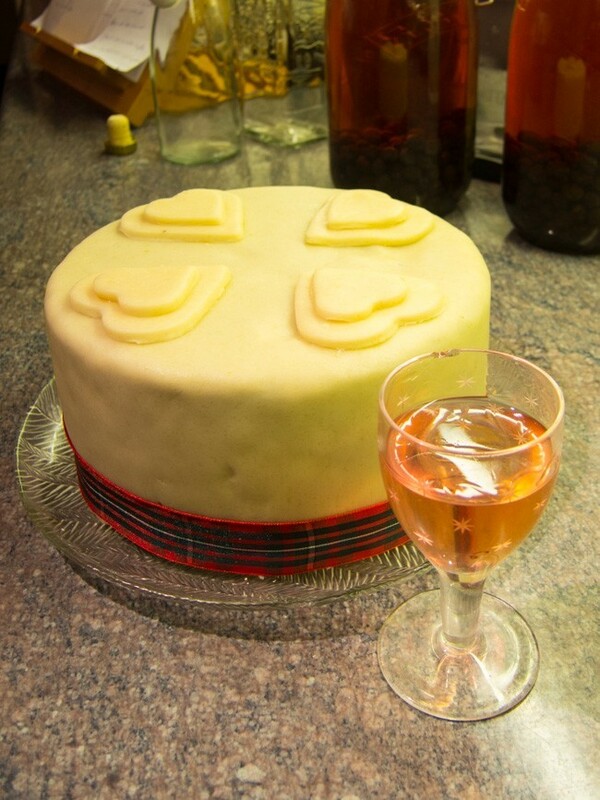 Once a week, or more if I remember, the cake is unwrapped, prodded, sniffed and then liberally painted with booze. I write ‘booze’ because I don’t think it really matters what you use so use up those dregs at the back of the cocktail cabinet (what, you don’t have one darling) but I stipulate it must have flavour (so no vodka), not be cream based and be greater than 20% alcohol (so no syrupy things). Don’t ask me if you can make it without the alcohol; this recipe has mandatory alcohol. This cake is best made several weeks before it is due to be eaten; Delia suggests a minimum of 8 weeks, so perhaps it should really be an October Half Term activity but I usually don’t remember until mid to late November and it still tastes great. 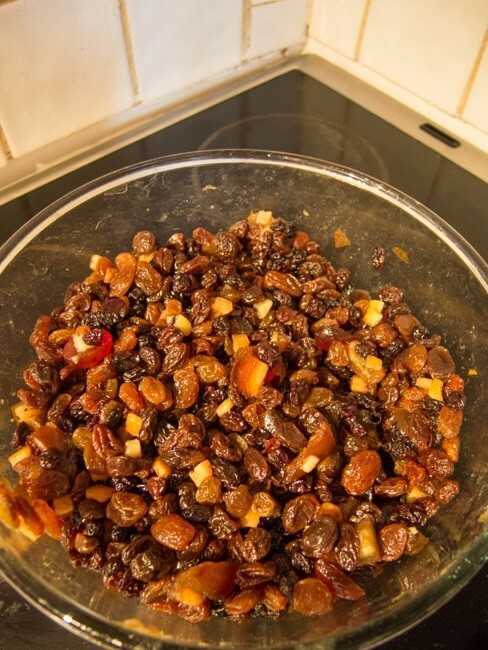 Several days before you plan do do the baking, put the fruit mixture into a glass bowl and add the booze. Cover with cling and shake daily until ready to use. Preheat the oven to 160 °C/140 °C fan with a shelf in the bottom third of the oven. Butter and double line a 20 cm round tin, with enough baking parchment to come several centimetres above the top of the tin. Wrap the outside of the tin with several sheets of newspaper secured with string. 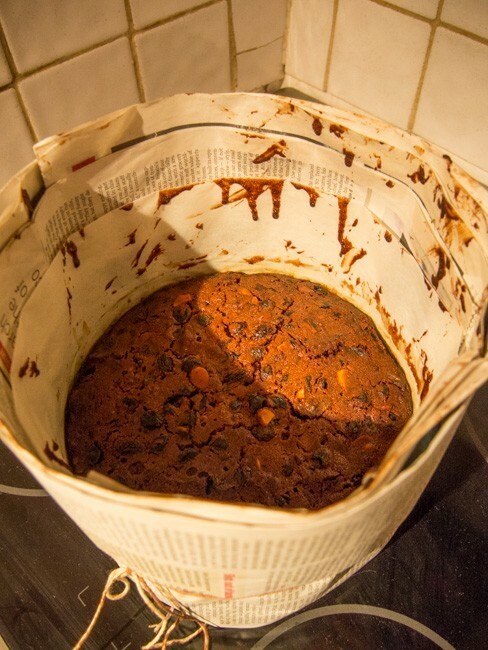 Sit the tin on top of more folded newspaper on a baking tray. Make a hat for the tin with double thickness of parchment cut to a circle that just fits inside and cut out a small circle in this in the centre (fold the squares of parchment up into quarters, the quarters again then round off the outer corners to give a circle and cut the point out of the circle – comprendé?). Cream the butter and sugar until very light. Whisk the eggs separately then add one at a time to this, mixing well between and adding some of the flour if it looks like it will curdle. Sift the flour, spices and salt over the top and then fold in. Fold in the fruit (and any booze left behind), the nuts, the treacle and rinds. Tip this mixture into the prepared tin and level off the surface. Place into the preheated oven and leave alone for 4 hours – walk the dog, do some study etc. The cake may take up to 4 and half hours but you still want a few crumbs sticking to the metal skewer when you test it; if you over cook it, it will be dry no matter how much booze you add. Leave to cool totally in the tin before unwrapping and then make some holes with a skewer all over the cake and brush or spoon over more booze. Wrap the cake in greaseproof paper and in a tin and repeat the feeding process ad infinitum. Decorate as you wish (no fondant for me please! ).